He was born in Tripura. His father belonged to the Maharaja of Tripura`s administrative staff, transferable job that exposed Dharmanarayan to variety of places in the state, at a very early age. 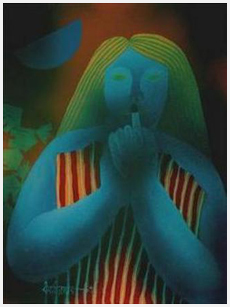 1970 He joined the Society of Contemporary Artists, Calcutta. 1960 Diploma in Fine Arts, Kala Bhavan, Santiniketan. Solo Exhibitions 1963 Exhb. at Artistry House, Calcutta. 1984 Participated Kala Yatra, Madras. 1985 Exhb. at Dhoomimal Art Gallery, New Delhi. 1985 Exhb. at the Calcutta Art Gallery, Calcutta. 1988 Exhb. at Chitrakoot Art Gallery, Calcutta. 1991 Exhb. at Dhoomimal Art Gallery, New Delhi.Group Exhibition 1961-63 National Exhibition, All India Fine Arts & Crafts Society, New Delhi; Birla Academy of Art & Culture, Calcutta; Academy of Fine Arts, Calcutta; West Bengal State Academy. 1964 Exhb. of Three Artists, All India Fine Arts & Crafts Society, New Delhi. 1966 Six Painters, Artistry House, Calcutta. 1967 Exhb. at Arts & Prints Gallery, Calcutta. 1971 Society of Contemporary Artists, Calcutta. 1979 Kala Yatra Exhibition, Madras; New Delhi; Kuala Lumpur; Calcutta. 1980 Drawings `80, Chandigarh 1981 Kala Yatra Exhibition, Ernakulam; Hyderabad; Indian Paintings Today, Jehangir Art Gallery, Bombay. 1982 Kala Yatra Exhibition, Bombay; Bangalore; London; Paris; Manchester. Victoria & Albert Museum, London. Chitrakala Parishad Museum, Bangalore. National Gallery of Modern Art, New Delhi. Lalit Kala Akademi, New Delhi. Birla Academy of Art and Culture, Kolkata. Delhi Art Gallery, New Delhi. 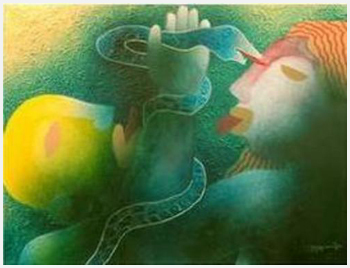 1981 Received award from Birla Academy of Art and Culture, Calcutta. 1989 Received Shiromani Puraskar, Asian Paints. Dharmanarayan Dasgupta in his lifetime remained almost entirely within the fold of the Calcutta art world, where he found his foothold. By the late 70`s, he had evoked a style by which he came to be known, where the prime medium he worked with was a special genre of egg tempera on canvas, using a mouth spray for finishing effect. A recognizable repertoire of characters and scenes animated his compositions with jocularity, mischief and satire seen in corpulent babus, buxom ladies and later on, an array of detached heads and tubular limbs that disturbingly glow out of still life objects. 1966-79 Art Teacher, St. Thomas Church School, Howrah. 1979-85 Teacher, St. Thomas School, Dasnagar. 1985-97 Faculty of Visual Arts, Rabindra Bharati University, Calcutta. Faculty Dean and Curator of the Rabindra Bharati University Museum, Calcutta.